For both learners and employees, competition is intense. Organisations around the globe are seeking knowledgeable, highly skilled and productive employees. While learning is now a bare necessity for a fulfilling career and complex lifestyles, soaring learning options make selecting a fitting qualification a challenge. New technology, a plethora of information sources and mediums have made passive learning methods obsolete. It is the responsibility of awarding bodies and delivery centres to update teaching methods to facilitate modern learning environments that encourage active learning. At Qualifi, we continuously aim to update our qualifications and delivery methods to create quality learning content that capture and hold the attention of the modern learner. Keeping in line with this vision, we have collaborated with Canvas to deliver our qualifications through an intuitive learning management system (LMS) that understands the needs of the modern learner. 1. Automatic sync – Teachers can easily create or update Qualifi assignments on Canvas and it will automatically populate the grade books and calendar. 2. Easy access – Canvas is a cloud-based LMS, which means that all work can be accessed whenever and wherever. Furthermore, teachers have the advantage of creating assessments on the system itself and students can view and work on it without having to go through the hassle of uploading and downloading documents (this leaves little room to pull off the classic ‘’the dog ate my homework’’ excuse). 3. Simple design and easy navigation – Without a doubt, the key point about Canvas is its brilliant utilisation of technology. Even as a new student, it doesn’t take much to figure out how to navigate through the learning system, with a dashboard that gives easy access to weekly modules and discussion forums conducted by Qualifi. 4. Fits in the pocket – Figuratively, of course. Canvas has been designed with the mobile access in mind and supports both iOS and Android. Our students can easily receive notifications and be informed about assessment due dates. Teachers can change the due date of a Qualifi course assessment through the app itself and students will be automatically notified of the change. 5. Quick support – Through Canvas, Qualifi can provide an easy communication mode to students, to ensure that they receive necessary support to conduct studies smoothly and progressively. 6. Consistent delivery – Qualifi’s courses are delivered via a network of approved learning centres. By using a centralised cloud based LMS such as Canvas, it helps ensure consistent delivery of courses across all partners while having the option of making monitored customisations where necessary. 7. Useful insights – The Canvas system allows us to derive custom reports to monitor each student’s engagement level. By comparing it with the specifications of each course, these system generated analytics help us improve our teaching and learning methods. 8. Efficient – The tedious task of grading assignments is made easier through the SpeedGrader tool in the Canvas system. It enables teachers to conduct a more thorough and less time-consuming job of grading and providing feedback. 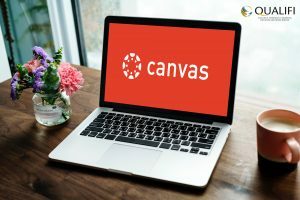 Canvas has revolutionised the way in which learning solutions are delivered, for both teachers and students – making online education more interactive, engaging and efficient. As a recognised UK awarding organisation, we understand the importance of having a learning management platform that is up-to-date with all the right tools to deliver the best learning experience possible for both teachers and students.